for some fun, prizes and beautiful cards. But first, how do you join in for a chance to win. 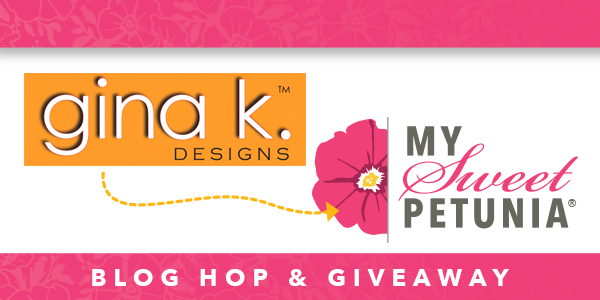 Each participant who comments on each blog post will be entered into a drawing for a chance to win our hop prizes which include the winner's choice of original or mini MISTI, or the Stitched Leaves mini kit from Gina K. Leave your comments by Wednesday September 5th at 11:00 a.m. EDT. For my post, I have a few cards to share with you today. I was having so much fun I got a tad carried away, making 5 cards. I am using Gina K's Boho Flowers Mini Kit for my cards today, along with the Gina K. stencil called Rounded Swirl. 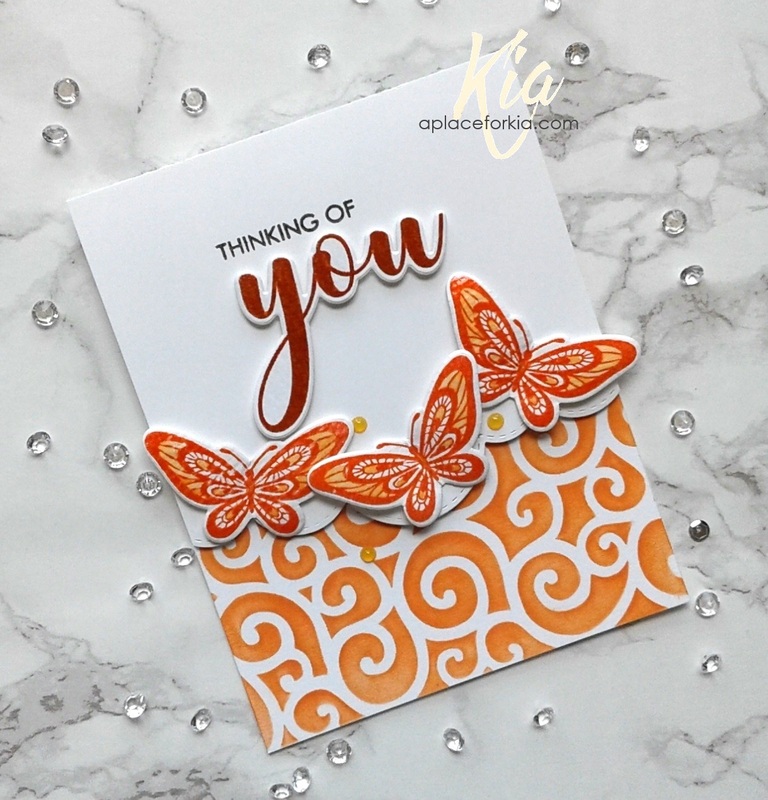 This card uses the flourish and butterfly, as well as the Rounded Swirl stencil for the background. More of the Boho Flowers done in white pigment ink and white embossing powder and stamped both on the card panel and again stamped and die cut and attached with foam dots to the panel. 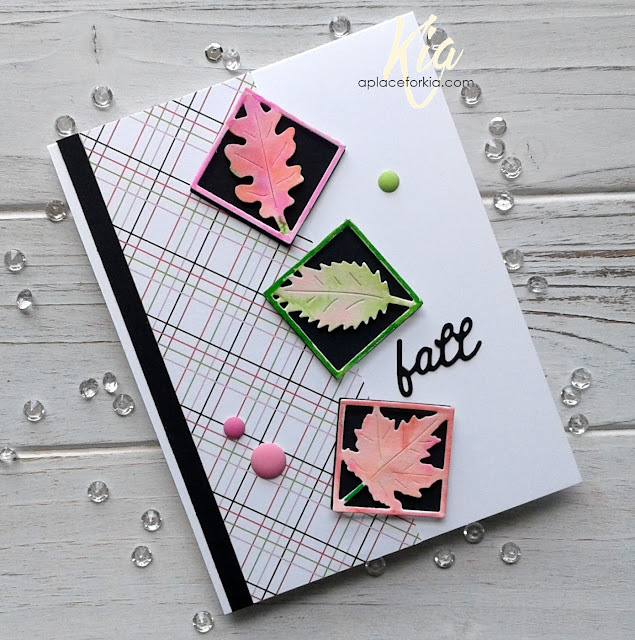 The falling leaves are from the tip of the flourish stamp. Thinking of you is the card I feature in my video, and I also explain how I did the other cards. Following is a list along with links of those participating in today's hop. You should have arrived here from Sheri Gilson's blog and next on the hop is Cathy Tidwell. Thank you for visiting the hop today, I hope you all enjoy yourselves. Products: MISTI, Gina K Designs Boho Flowers Mini Kit, Gina K Designs Art Stencil Rounded Swirl, Tim Holtz Distress Inks, Simon Says Stamp Intense Black Ink, Neenah Cardstock, Ranger Watercolour Paper, Clear Embossing Powder, Tonic Studios Mixed Edges Rectangles, Sizzix Dotted Rectangles, Frantic Stamper Deckled Circle Die Set, Mama Elephant Landscape Trio Die Set, Foam Strips and Dots, Nuvo Orange Marmalade Jewel Drops, Sequins. There is something about the way the oxide inks lay down that I just love, even without doing something fancy. I did this card just to feel the ink. I only have a few of them, but I look forward to adding to my collection. I first stencilled my card base using ARTplorations Weaving stencil, then added in the die cut tag to stencil partially on it, going off the page to the left. I sponged on the colour to the tag top banner, then attached the tag to my card using foam tape. I added the "for" die cut which I coloured with black marker, and the stamped and die cut "you". With white twine, I added a bow to my tag and finished up by adding a few sequins. Products: ARTplorations Weaving Stencil, Frantic Stamper Tag Builder #2, Gina K Designs Boho Flowers Sentiment stamp and die, Tim Holtz Distress Oxide Inks Worn Lipstick, Cracked Pistachio, doCraft Black Marker, Foam Strips, Sequins, Twine. 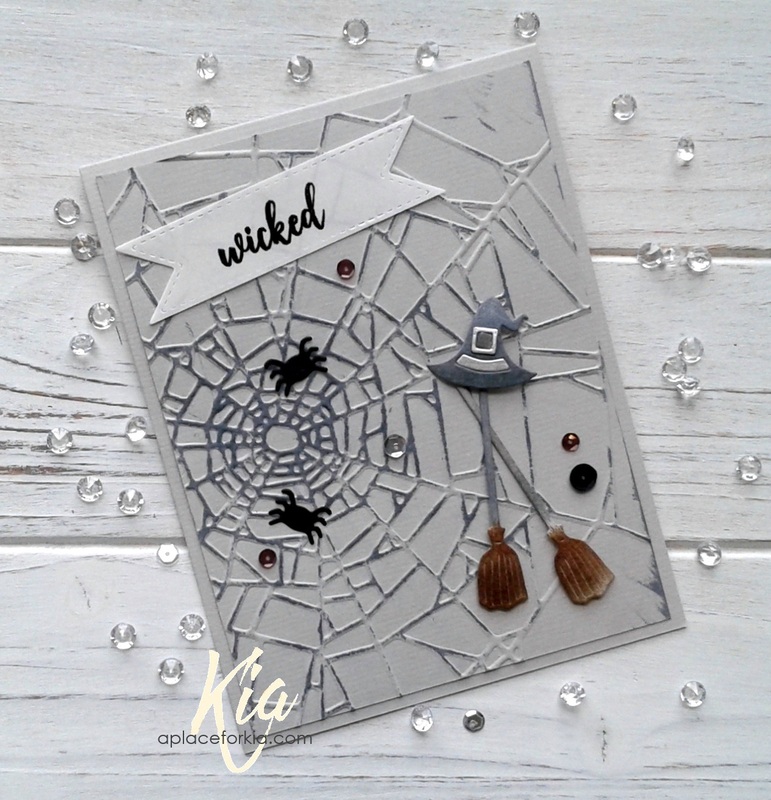 It is never to early to make Halloween cards! For this card I used the newly released Witches Gear, which I die cut and coloured using distress markers along with a silver marker. I started by using the same grey cardstock for my base and panel. I embossed the panel using my cobwebs embossing folder then added ink to the webs and edges. A few of the spiders from the Spider Web Corner Die Set, were added to the web. I stamped "wicked" on the vellum label, and heat embossed with black embossing powder. A few black, brown and silver sequins finished this card. Products: Frantic Stamper Witches Gear, The Witch is In Stamp Set, Spider Web Corner and Spider Die Set, Stitched Double Fishtail Labels; Sizzix Tim Holtz Cobwebs Embossing Folder, Neenah Cardstock, Vellum, Krylon Silver Leafing Pen, Tim Holyz Distress Ink Black Soot, Tim Holtz Distress Markers, Black Embossing Powder, Sequins. This is a card I did for a friend's birthday last week so I did not want to share it until now. She has fish tanks, and loves anything from "under the sea". I had a lot of fun painting this using Tim Holtz Distress Oxide Inks. I first stamped on Arches Watercolour Paper and heat embossed with black embossing powder, then proceeded to colour. For a bit of sparkle I added Wink of Stella to the bubbles, then matted in the black and blue before attaching to my card base. 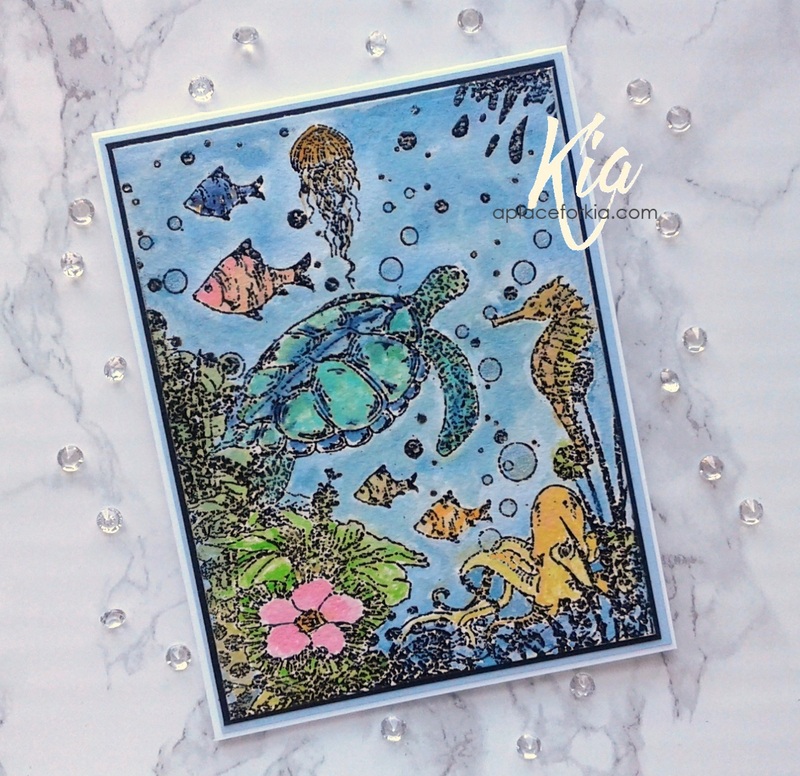 Products: Stamp Junkies Under the Sea, Tim Holtz Distress Oxide Inks, VersaMark Embossing Ink, Neenah Cardstock, Paper Garden Cardstock, Arches Cold Press Watercolour Paper, Wink of Stella, Black Embossing Powder. A card I did for my neighbour who wanted a card for a little girl's birthday. 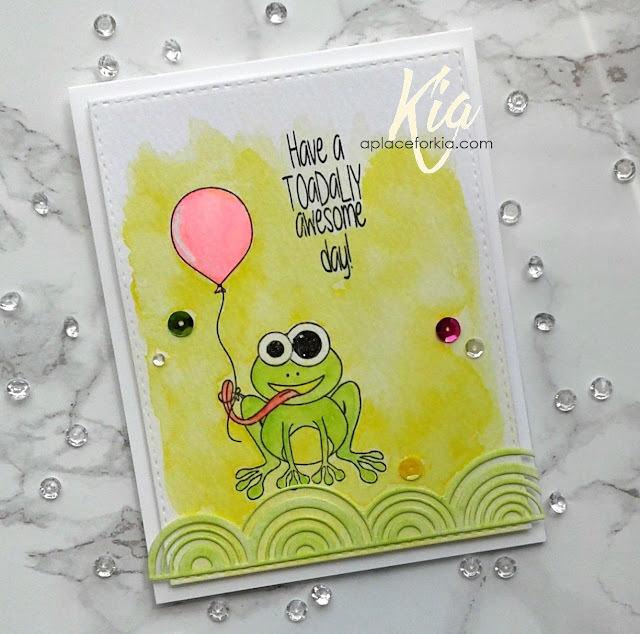 I wanted to keep the green of the frog present in the card so I used mustard seed for my background, and twisted citron for the frog and sunrise border die. In my Misti, I first sponged on the mustard seed then stamped the frog and sentiment in the black ink. I water coloured the frog and the balloon, then activated the background with water for the wash. The panel is die cut with the stitched rectangle and attached to my card base on fun foam. It is difficult to see in the picture, but I have Wink of Stella on the frog's eyes. The pink of the balloon is done with my Zig Neon Pink brush. And, for more sparkle I added sequins. I think the little girl will like it, or I hope so ... thank you for visiting today. Products: Misti, Joy Clair Hoppy Birthday, Simon Says Stamp Sunrise Border, Simon Says Stamp Stitched Rectangles, Neenah Cardstock, Ranger Watercolour Paper, Tim Holtz Distress Inks Mustard Seed, Twisted Citron, Zig Brush Neon Pink, Geranium Red (tongue), Simon Says Stamp Intense Black, Fun Foam, Sequins. 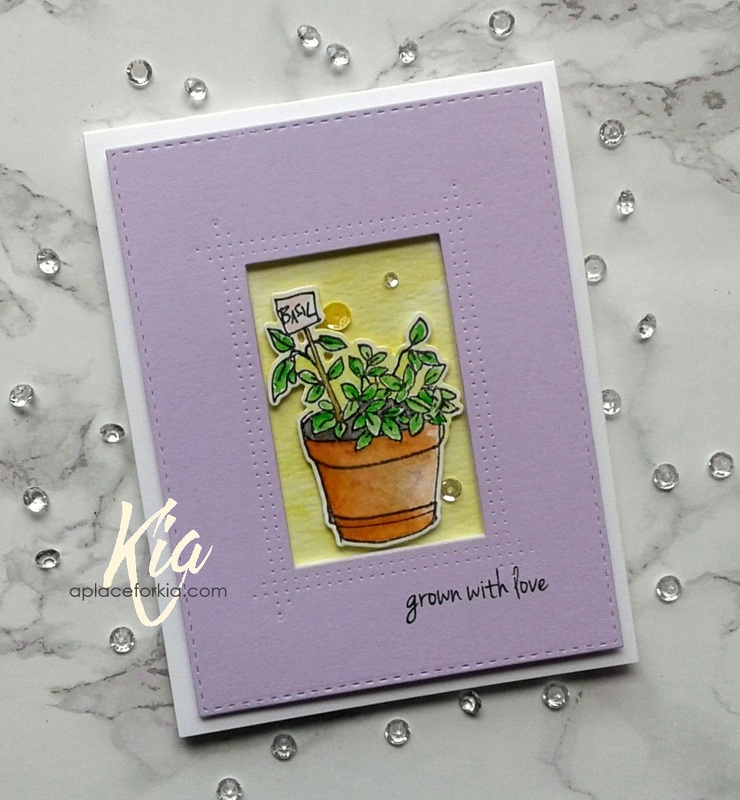 This basil stamp image is the perfect kind of image to showcase using this new to me die from Memory Box. To start my card, I first did a watercolour wash using for my background on watercolour paper. I then stamped the basil image and proceeded to watercolour with Zig brushes and once dry, I die cut the image. On the lavender paper I die cut using stitched rectangles along with the frame die and propped the panel up on fun foam, which I also cut using the dies. The basil is attached using a foam strip, so it has dimension, but not as high as the framing. I stamped the sentiment in my Misti, removing the rubber mat to accommodate the height of the card, and finished with a few sequins. Thanks so much for dropping by, see you next time. Products: Misti, Altenew Garden Grow Stamp and Die Set, Memory Box Pinpoint Double Frame, Simon Says Stamp Stitched Rectangles, Neenah Cardstock, Gina K Lovely Lavender Cardstock, Ranger Watercolour Paper, Daniel Smith Watercolours, Zig Clean Color Brushes, Fun Foam, Foam Dots, Sequins. This is Burst of Flowers! 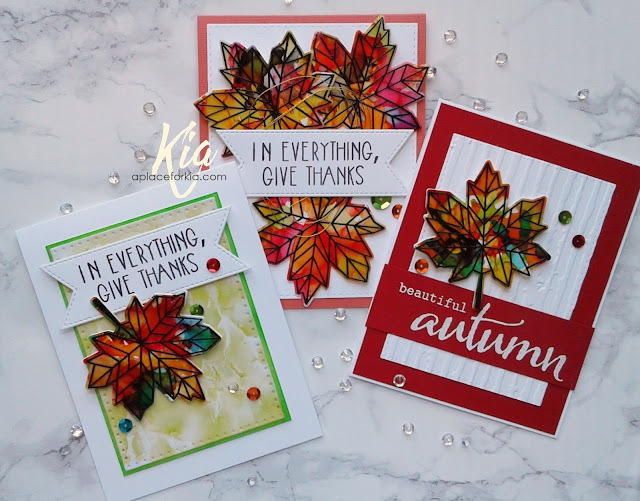 These wonderful flowers are part of the latest release, Fall Greetings, at Frantic Stamper. 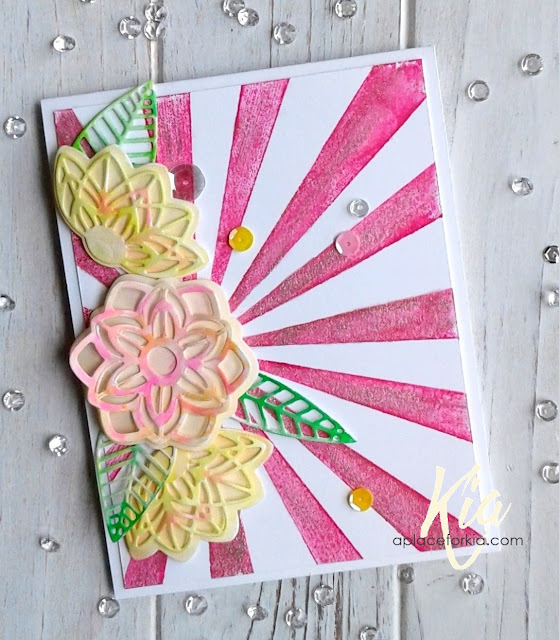 To begin this card, I inked up my panel with the Sun Rays stamp using Tim Holtz Distress Ink Picked Raspberry. I then covered the rays with Wink of Stella for the glow of the sun. For the flowers I die cut both the Boho Flowers and the Grateful Flowers Outline using watercolour paper, which I then painted with my Zig brushes adding a few layers of colour. I then styled and arranged the flowers on the side of the card, adding a few of the leaves and finishing with a scattering of sequins. There is also the Grateful Flowers coordinating stamp set, which I failed to order. How could I forget to get the stamps?! I will rectify that shortly. I hope you enjoy this card and thank you for visiting my blog today. Products: All dies and stamps are Frantic Stamper, Neenah Cardstock, Fabriano Hot Press Watercolour Paper, Tim Holtz Distress Inks Picked Raspberry, Zig Brushes, Wink of Stella, Stylus, Sequins. How about some Halloween today? The new release called Fall Greetings at Frantic Stamper includes Halloween stamps and dies, and they are so very fun. For some reason I associate purple with Halloween and love using that colour along with orange on my cards. 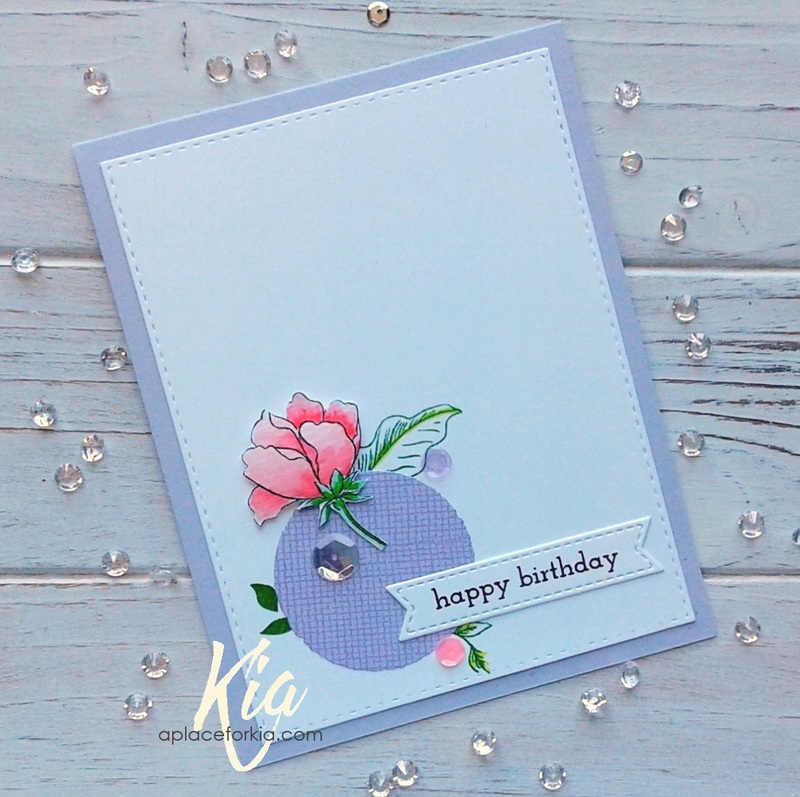 This card is no different, using dusty concord I started by stamping my background using the new Boo Eek Creepy background stamp and attached that panel to a deep purple cardstock. I then stamped my smaller panel using the 6x6 Grunge Crosshatch background stamp and matting it again with the deep purple cardstock and attaching it to my card base. I die cut the legs in both orange and white cardstock, and the boots in black cardstock from the Mix-n- Match Witches Legs and attached to my card on foam dots. A few dew drops and gold paint on the boots finished my card. Products: Frantic Stamper Stamps and Dies; Neenah Cardstock, Paper Garden Cardstock, Tim Holtz Distress Ink Dusty Concord, Dew Drops, Gold Ink, Foam Dots. I used a pale mauve cardstock for my card base and topped with a panel cut from Neenah cardstock. I die cut the circle using designer paper, and fussy cut the flower so there would not be a white border. In my Misti, I arranged my stamps to stamp where they would be coming out from the circle. Once stamped I attached the circle, along with my flower. 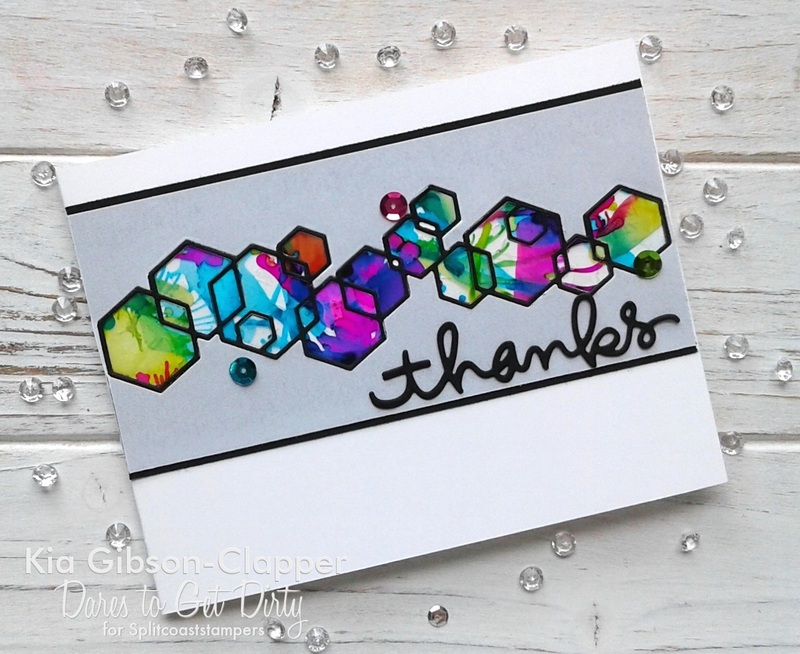 I stamped the greeting and die cut with a label die and attached adding a few sequins to finish. Products: Altenew Peony Bouquet Stamp Set, Altenew Super Script One Sentiment, Frantic Stamper Deckled Circles, Frantic Stamper Stitched Double Fishtail Label Dies, Simon Says Stamp Stitched Rectangles, Zig Brushes, Altenew Ink, Paper Garden Cardstock, Neenah Cardstock, MFT Tranquil Textures Designer Paper, Sequins. 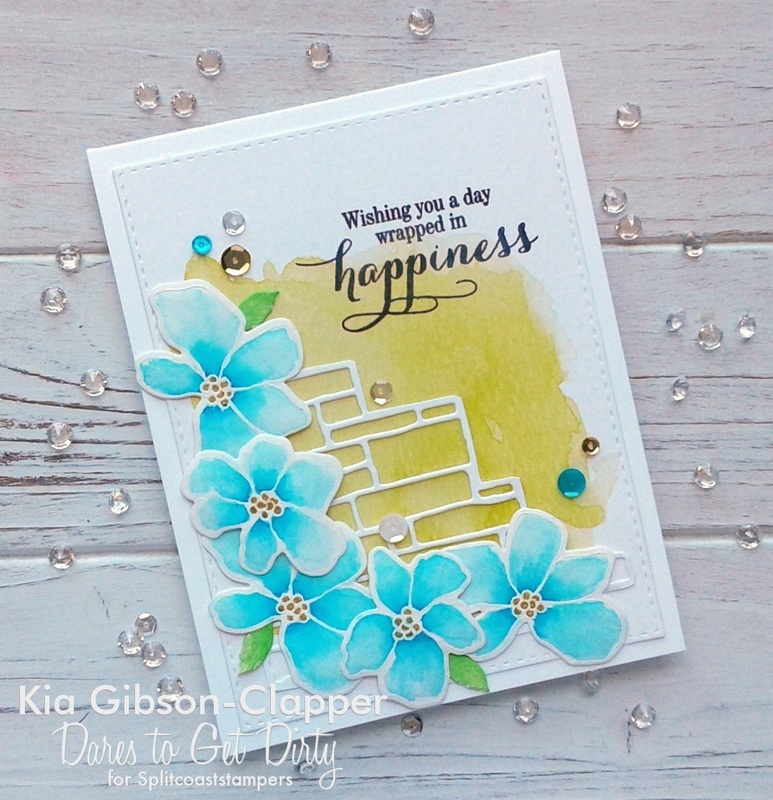 I am hosting the Clean and Simple Challenge at Splitcoaststampers today, where we are playing with monochromatic designs. For my card I stamped using my Zig Brushes in Carmine on Ranger watercolour paper and coloured one of the flowers using the same colour. 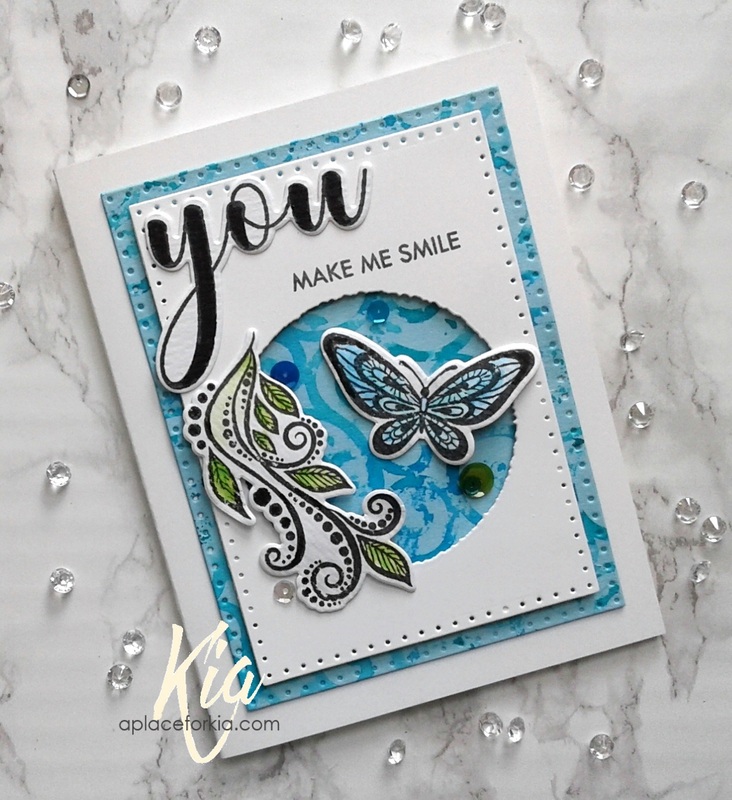 I stamped my sentiment on vellum with VersaMark embossing ink and heat embossed with silver embossing powder, then die cut the sentiment attaching that to another piece of vellum, then attached to my card using foam strips, and added a few sequins to finish. Products: Altenew Peony Bouquet Stamp Set, Stamplorations Fond Expressions Stamp Set, Paper Garden Cardstock, Ranger Watercolour Paper, Vellum 38lb paper, VersaMark Embossing Ink, Silver Embossing Powder, Sizzix Dotted Rectangles, Foam Strips, Sequins. Autumn is a favourite time for me, the colours are amazingly beautiful, the temperatures are human and walks in my local park are enjoyed. This card shows the beauty of the season for me. The dies on this card are from Frantic Stampers latest release called Fall Greetings. I die cut the leaf vignettes using watercolour paper and painted using Zig brushes with a few layers of colour on each square. I added a piece of designer paper to my card base, and trimmed it with black cardstock. I also die cut 4 squares to match the leaf squares in the black cardstock and attached my watercolour leaf squares with foam dots, then arranged them on my card so the leaves were in different directions. I added the fall die cut sentiment, and a few sprinkles to finish. 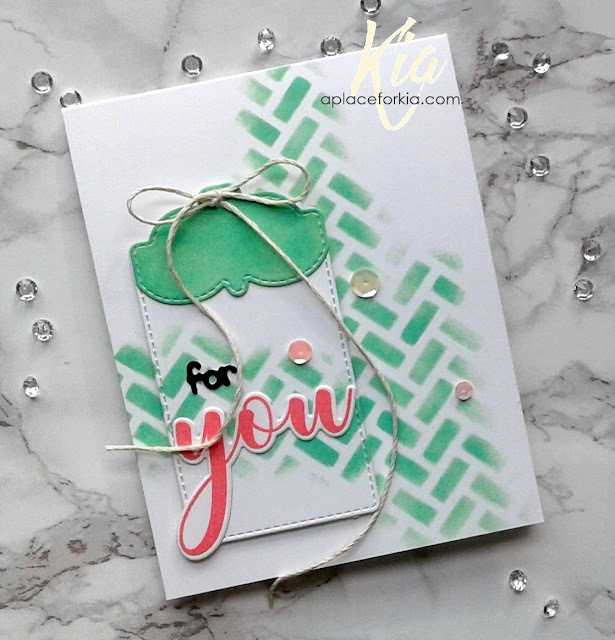 Products: Frantic Stamper Leaf Vignette, Frantic Stamper Fall sentiment from Frantic Stamper Fall Harvest Panel, Zig Brushes, Neenah Cardstock, Arches CP Watercolour Paper, Paper Garden Black Cardstock, Reverse Confetti True Love Designer Paper, Doodlebug Sprinkles, Foam Dots. It is that time of year that I start thinking about making my Christmas cards for this year. I like to support the Caring Hearts Card Drive every year and I have my own cards to think about, and they all have to be different. But, I dare say, I might have to make another one of these cards, as I do love the look. 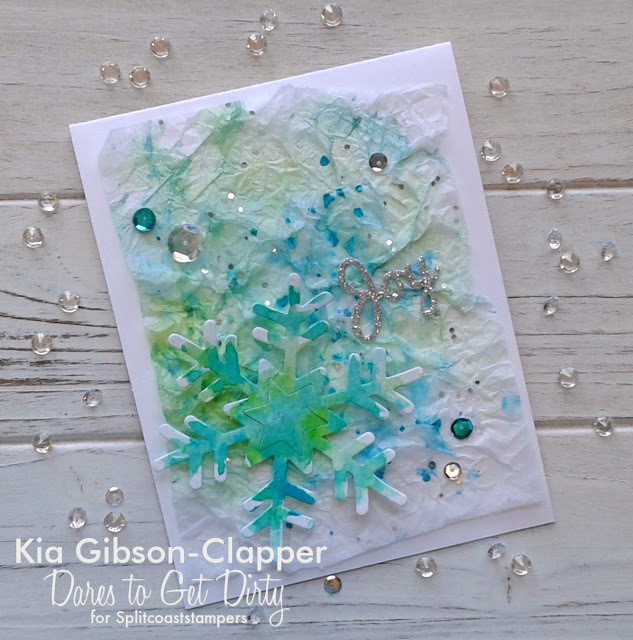 There is splattered inks and puddles of inks used for the snowflake, some tissue paper with silver flecks in it and in case there is not enough sparkle, there are also sequins along with the sparkle of the glitter sentiment. I hope this card has you thinking about Christmas and smiling while you do. 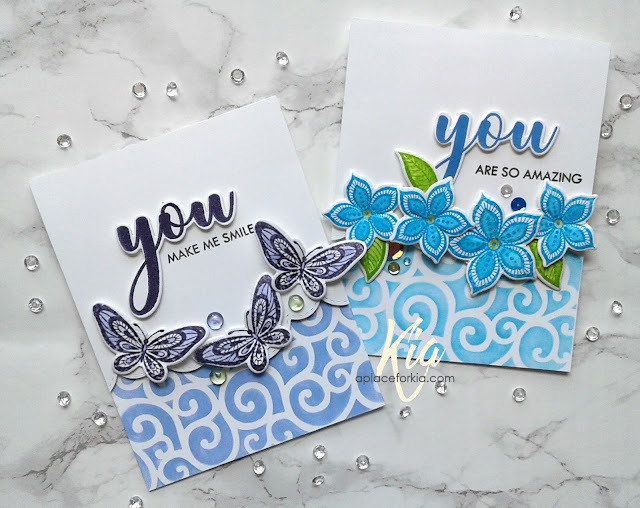 I have a couple of cards to share today showing cards I made with the Cling Wrap Background that can be found under my tab Awesome Tutorials. 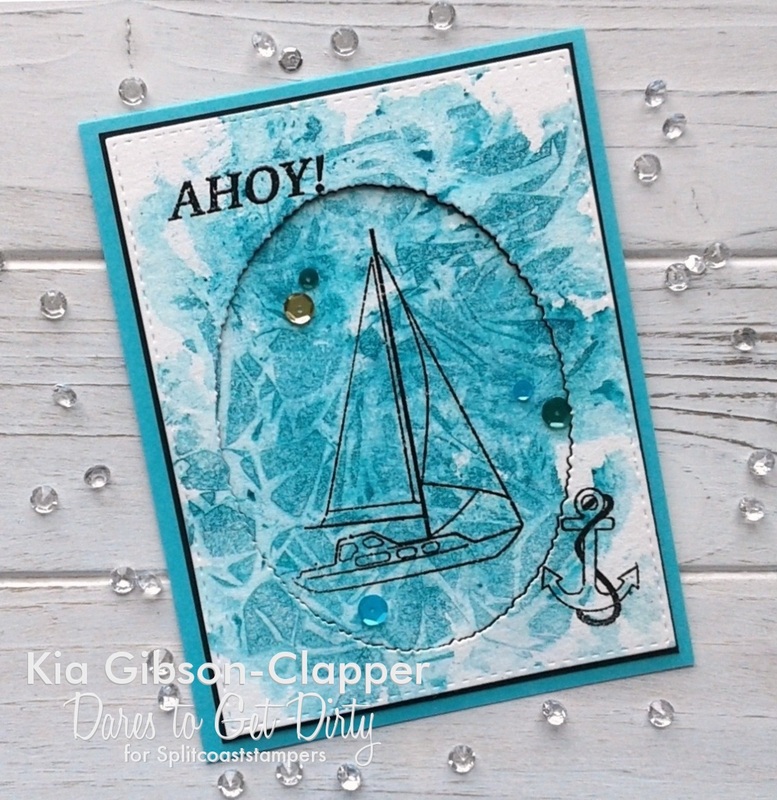 For the card above I created my scene by stamping with black embossing powder and die cutting the sailboat using my oval deckled die, which reminded me of a choppy water. The outside panel is attached with foam strips and I added a few sequins to finish my card. For this card I used the technique to represent the skies and clouds, along with the earth and sun, this time using my circle deckled die. 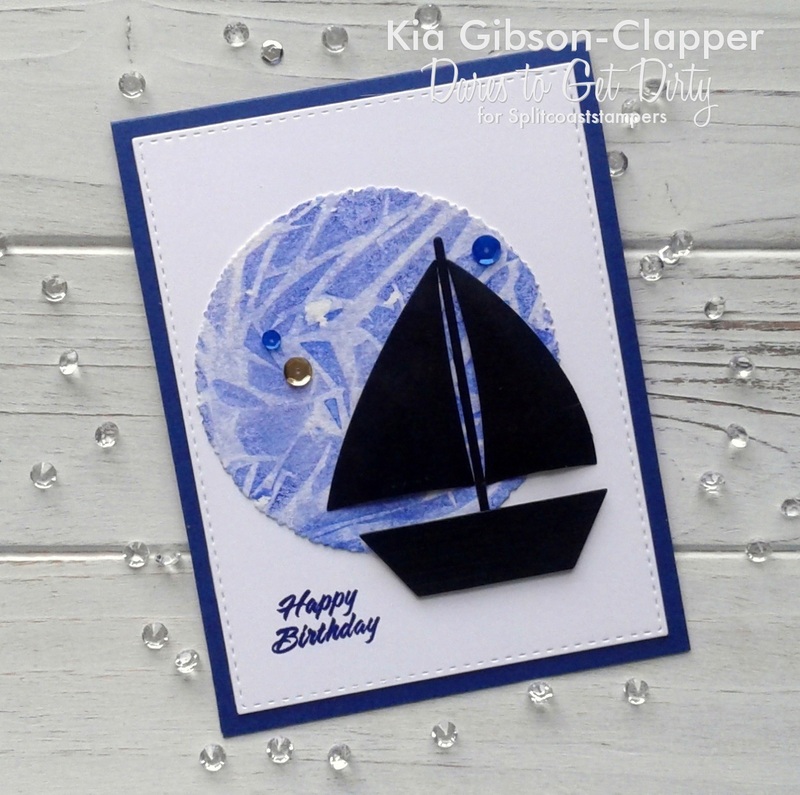 I die cut the sailboat using black cardstock and stamped an easy birthday sentiment. 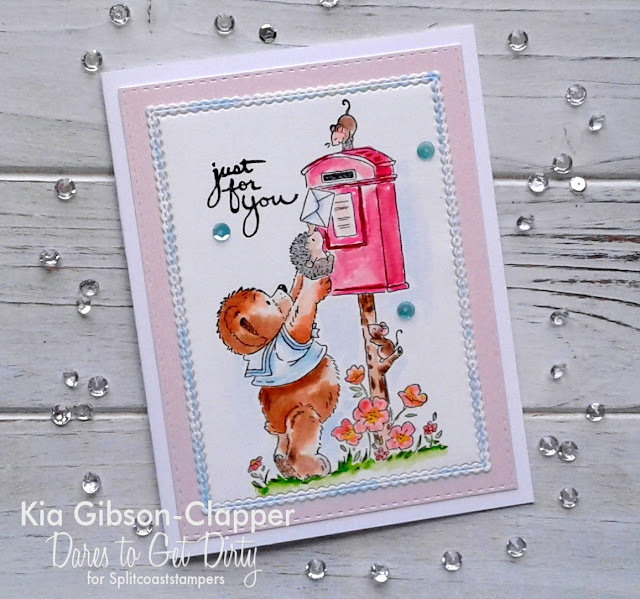 I hope you enjoy both of these cards and thank you for visiting my blog today. Sharing with you another card I did for the Dare to Get Dirty challenges last week. I had so much fun, and made many cards to share. To start this card, I did a background wash in yellow on watercolour paper and once dry I die cut the panel using my stitched rectangles. 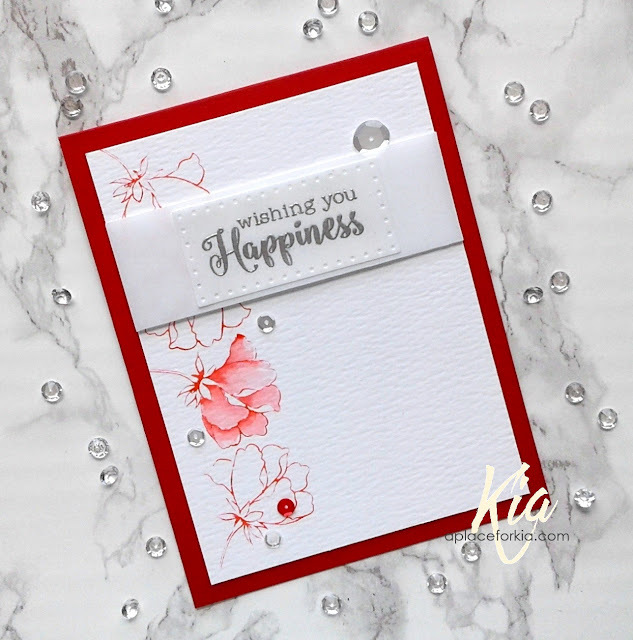 In my Misti, I stamped the flowers and heat embossed using white embossing powder, and proceeded to watercolour using my Zig brushes. I added gold paint to the centre of the flowers. To put it all together, I attached my background panel to my card base inside my Misti, using the grid lines to ensure everything is straight. I die cut the brick panel using the watercolour paper for the texture, and fussy cut along the right edge, then attached to my panel using matte glue. For the flowers, I used the foam pad from my Misti and styled the flowers with my stylus, then arranged on my card, attaching either with glue or on foam dots for more dimension. I die cut a few small leaves in watercolour paper and painted them with my green Zigs and attached with matte glue. 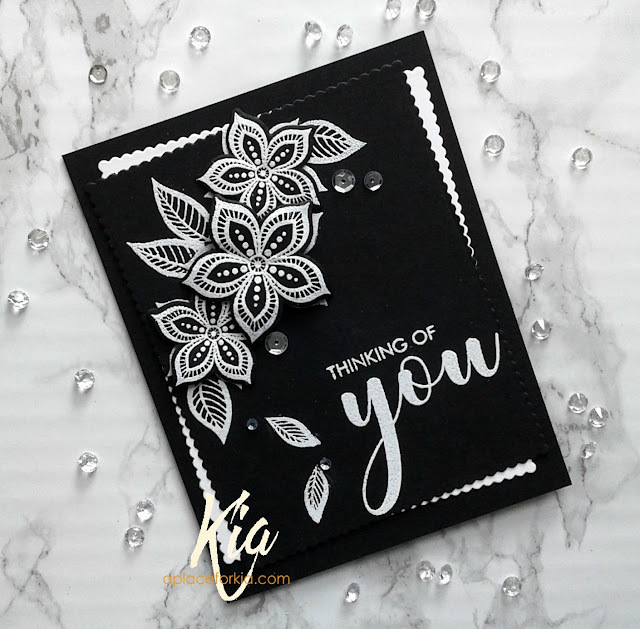 As I do this all in my Misti, it is easy for me to now stamp my sentiment where I want it to be using intense black ink, and I finished by adding a few sequins. I hope you enjoy this card, and thank you for visiting my blog today. Products: Simon Says Stamp Artful Flowers Stamp Set and Designer Flowers Die Set, Penny Black Sprinkles and Sparkles Stamp Set, Tim Holtz Mixed Media #4 Die Set, Simon Says Stamp Stitched Rectangles, Neenah Cardstock, Ranger Watercolour Paper, Fabriano Hot Press Watercolour Paper, Zig Brushes, Daniel Smith Watercolours, Simon Says Stamp Intense Black, Foam Dots, Sequins. I am up on My Sweet Petunia's blog today featuring these cards, and I have done a video, my first ever. It is longer than I would have liked, but the featured card is the card on the left above, and there are two techniques that I did on this card. I hope you will visit My Sweet Petunia and check out the details and close up pictures. For those who want to see the video here, following is the link. The closeup pictures will only be found at My Sweet Petunia until Friday of this week, then I will add them to this post. Products: Neat and Tangled Maple Leaf Stamp and Die Set, Winnie & Walter Big Bold Sentiments, Memory Box Garden Bare Branches Stencil, Frantic Stamper Stitched Double Fishtail Labels, Sizzix Dotted Rectangles Die Set, Tim Holtz Alcohol Inks, Acetate, Neenah Cardstock, Paper Garden Cardstock, Black Embossing Powder, Gold Thread, Sequins, Foam Strips. 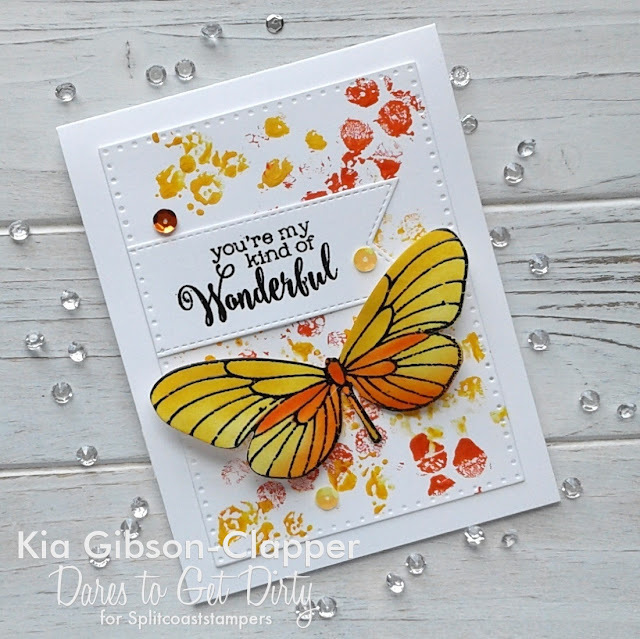 Butterflies and ink spots makes for a happy card. I wanted to share this card that I did for one of the Dare to Get Dirty Challenges at Splitcoaststampers. Once again, I am playing with some of my favourite colours. The background is done with acrylic inks and the butterfly with distress inks. A quick and easy card to share with you today. 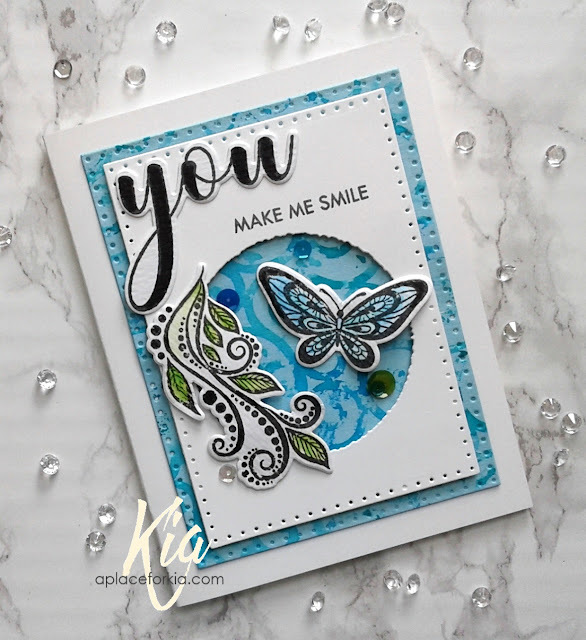 Products: Stampendous PenPattern Butterfly Stamp Set and Die Set, Acrylic Inks, Tim Holtz Distress Inks, Simon Says Stamp Intense Black Ink, Frantic Stamper Double Fishtail Label Die, Sizzix Dotted Rectangles, Neenah Cardstock, Foam Dots, Sequins. This stamp is one of the first good stamps that I bought when I was starting out. To this day I love it and now that I somewhat know what I am doing, I love to colour it. It is one of those images that is a keeper. I painted using Daniel Smith watercolours and die cut my panel using my scalloped die. The frame separates from the main panel with this die, so it was easy to add a bit of colour to the frame. I matted with a pale pink cardstock die cut using my stitched rectangle dies and finished with a few light blue sequins. Making this card had me smiling, and I hope you enjoy it too. Products: Penny Black Team Effort, Stampendous Sunny Flowers for the sentiment, Memory Box Scalloped Stitched Trimmings Die Set, Simon Says Stamp Stitched Rectangles Die Set, Daniel Smith Watercolours, Simon Says Stamp Intense Black, Neenah Cardstock, Fabriano Hot Press Watercolour Paper, Bazzill Cardstock, Sequins. I just love this little set and have so much fun each time I use it. I made this card for the Dare to Get Dirty challenges at Splitcoast, so the challenge details are a secret. You can read more about that here. I embossed a panel for my background and sponged on some dried marigold. In my Misti I stamped the images where I wanted all of them before using my Zig brushes to paint everything. I then die cut the pieces, gluing the large nut down to the background and propping the little squirrels to my frame. I added the sequins, using acetate to keep the sequins in place. I added twine to my front panel along with a tab so it can be easily pulled to remove the panel. Here is the card with the panel closed. Products: Neat & Tangled Favorite Nut Stamp and Die Set, Simon Says Stamp Stitched Die Set, Elizabeth Crafts Swirly Curves Embossing Folder, Tim Holtz Dried Marigold Distress Ink, Neenah Cardstock, Fabriano Hot Press Watercolour Paper, .Fun Foam, Sequins, Twine, Foam Dots, Acetate. Don't be left out ... today is the last day to order the fabulous studio bags from My Sweet Petunia at the introductory price. 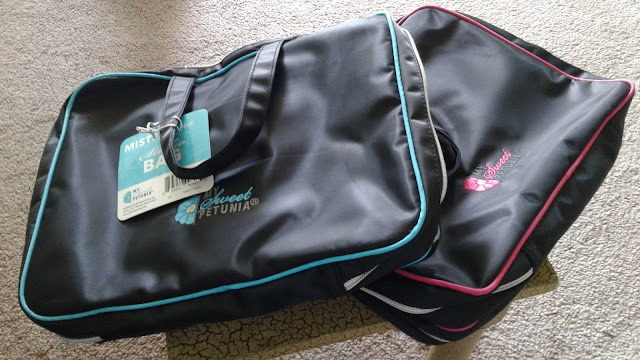 These are my two bags, one in pink and the other in turquoise. 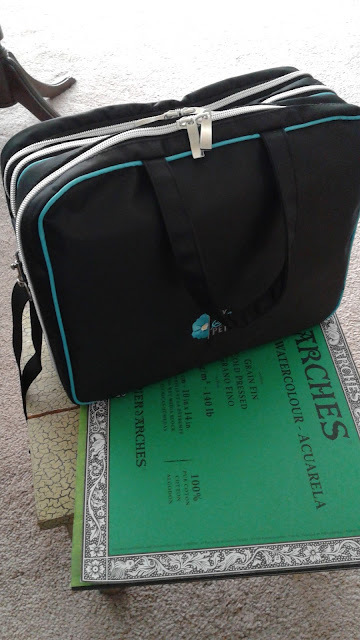 The pink I am using for my card crafting, and the turquoise is already packed with room to spare with everything I need for my watercolour classes. When I am leaving I stick in my wallet, my glasses in their case. my phone and my keys. If needed, I will also add in my watercolour palette that I use for my cards as sometimes I use those colours at class. So hurry on over and get your Studio Bag today! For my card today, I used up some of the blown ink background that I featured on my card yesterday. Instead of using my design for a background I used it for die cutting. As it is acetate, I used my steel plate for cutting to ensure a good crisp cut. It would be very difficult to see the cut lines otherwise. This card is for another of the Dare to Get Dirty challenges at Splitcoast. Although the details of the challenge are a secret, you can read all about the fan club here. I can tell you that I wanted this card to be entirely different from my card of yesterday. I first attached vellum to black cardstock, then die cut the piece using my steel plate, to get the negative of the die in the piece, then attached to my card base. I die cut the blown ink pieces and attached them in the negative. The sentiment is cut using the same black cardstock and I added a few sequins, which could easily be left off for a more masculine look if one prefers. Products: Frantic Stamper Linked Hexagon, Simon Says Stamp Thanks Die, Alcohol Inks Sailboat Blue, Citrus, Lettuce, Butterscotch, Raspberry, Neenah Cardstock, Vellum 40lb., Paper Garden Black Cardstock, Sequins, Vellum Tape. Hugs is keeping with my recent addiction to colour! All things colour work for me, and I hope you as well. 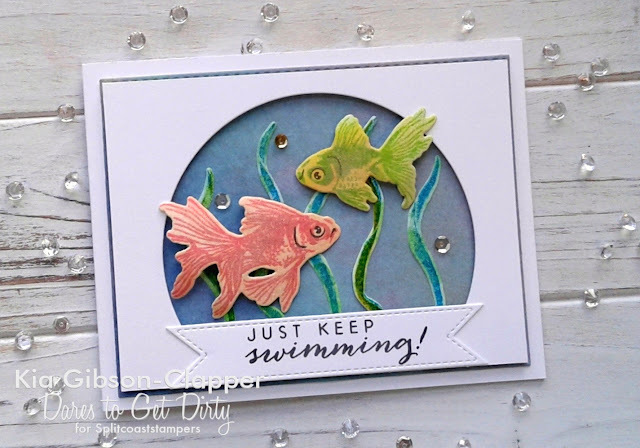 The inspiration for this card came from the Dare to Get Dirty Challenges at Splitcoast, which are a secret, but you can read all about it here. You may remember this card, where the technique was to blow through a straw to move the watercolour. This card is done using the same technique, but the paper is acetate and the inks are alcohol inks, which you all know are beautifully vibrant. It is very easy to do, and makes for a great background. For some dimension I added the die cut frame on foam strips and the hugs sentiment, also on foam strips which also has 3 layers. Thank you so much for visiting today ... I will see you next time. Products: Impression Obsession Frame Die Set; Simon Says Stamp Hugs Die; Tim Holtz Alcohol Inks Sailboat Blue, Citrus, Lettuce, Butterscotch, Raspberry; Neenah Cardstock, Acetate; Foam Strips; Sequins. My first challenge is up today at Splitcoast for the Dare to Get Dirty Challenges, going on all this week. I hope you will come and join us for these fun challenges. You can find out all the details here. Although the details of the challenge are a secret I can tell you that I used Tim Holtz Distress Oxide Inks on my card, and this card was the first time I used the inks. I only have four colours and the re-inkers presently, but plan to add to them in due course. I attached my top panel on foam strips and and also attached the fish on foam dots, so there is a lot of dimension on this card. Products: Hero Arts Coloring Layering Goldfish Stamp Set; Tim Holtz Distress Oxide Inks Worn Lipstick, Fossilized Amber, Cracked Pistachio, Faded Jeans; Tim Holtz Distress Inks Crushed Olive, Salty Ocean, Twisted Citron, Carved Pumpkin, Worn Lipstick, Simon Says Stamp Intense Black; Neenah Cardstock, Fabriano Hot Press Watercolour Paper; MFT Die-Namics Stitched Arch Die; Hero Arts Colouring Layering Goldfish Die Set; Frantic Stamp Fishtail Labels Die Set; Foam Strips, Foam Dots, Stylus, Sequins, Perfect Pearls Glimmer Mist, Wink of Stella.